Depending on the season, lowering or raising your thermostat just 4� can cost an additional $35 to $50 per month. Running the Heating & Air Conditioning Booster over the same period costs about 60 cents! 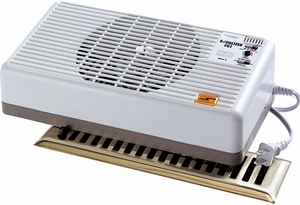 Ideal for wall or floor registers, the Heating & Air Conditioning Booster can be placed over a standard 12" x 6" floor register and plug into a 110V outlet. For wall vents, the booster easily installs with 4 screws. Features automatic or manual operation.